It came from a 20-minute short that I did for Sky called King For A Term. And then the opportunity came to extend it and maybe tell some longer stories about the 1980s – we discovered we loved looking at that period and that it might work as a comedy. Plus there were areas in my life that were interesting to me, that I thought could sustain a bit of a situation comedy. It follows two families that live in the same block of flats: their sons play together, and it’s about what it’s like to live in a community, where ‘in the long run’ we’re all the same. There’s no trickery, you like these people or you don’t. And it’s nice to have a multicultural cast, it’s nice to see an African family on screen alongside an English family. And my character, Walter, his younger brother Valentine comes over from Sierra Leone. He’s a bit of a ladies’ man, a bit of a chancer, a bit of a jack of all trades. The story is about him coming here, and how the characters adapt. It’s a bit of a mish-mash, to be hones, it really is. Just a good look at the 1980s, which was when I was turning from boy to teenager. It’s looking at what London was like then, especially east London, where I came from. I think it has drama, too… As the title suggests it’s really just a slice of life, and why we’re all the same, to some degree. And Bill Bailey’s character Bagpipes? Bagpipes is a guy who works with Walter in the factory, and he lives upstairs from where the Easmons live. They’re friends, they’re neighbours, they work together and their children play with each other. It’s been all right, but it’s a bit sad: my old man passed a few years ago, so it’s bittersweet in places. But this character’s taken on a life of its own. I’m not really doing an impression of my old man. What’s been your role as producer? This is a really interesting show to make, because I’ve never done comedy, never produced comedy. It’s not up to me to be the fact checker, because it isn’t all based on my life, it’s more about just making sure that we make a truthful snapshot of the 1980s, which I do hold close to me. And actually it’s just nice to see something go from an idea into fruition and then end up on the TV – that’s a great accomplishment. I think the 1980s was like a bit of an English growth spurt, in terms of culture, in terms of legislation, parliament… lots of really big changes happened back then. And essentially some of our identity now comes from that time. It was a very colourful era: we went from quite conservative clothing to quite outlandish clothing, and from being tight-lipped to quite outspoken. It was the birthplace of some of the greatest artists in the English pop music scene. And one of the things we tried to examine in the script is that people were a lot more carefree, rightly or wrongly, about what was said. What are your strongest memories from the era? I look back at that time fondly. It’s when I learned I was capable of doing quite a few things. I learned that if I picked up an instrument I could play it, that if I ran fast I could win a race, if I played football... you know, I just learned that I was capable of stuff, and sort of lucky in that sense. That’s when I realised: I’m as good as the next man, if I really apply myself. You’re a major league Hollywood star. Why make a TV comedy? The opportunity to now produce something, to be the author of it, to really push that out there, that’s different for me. I might have movies coming out, but I’m not really the producer of them. This one is starting from grassroots, and I love that. I love it! I’d never done it before and it’s very different from drama – the scheduling is very gruelling. 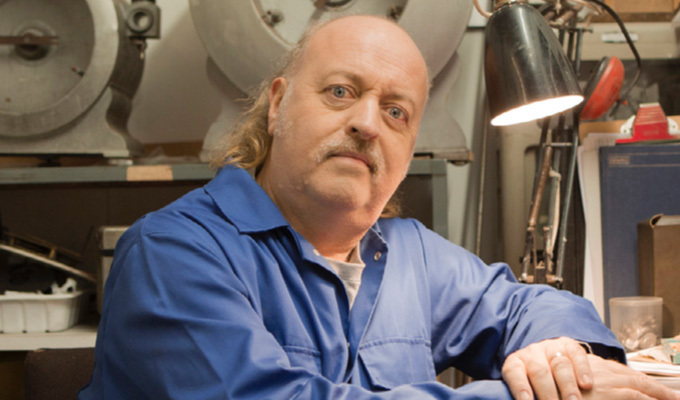 But I love working with Bill Bailey, who is a natural comedian, he doesn’t overdo it. And when I do a lot of drama, it tends to be quite heavy, so this is nice. What kind of a man is Bagpipes? He’s a gentle soul. He’s a bit naive, a bit gullible, a bit of a buffoon, but essentially he’s a good sort. And he’s a provider: he looks after his family and they’re very important to him. I think because Kirsty, his wife, is younger and she’s had an affair, he’s a bit protective, and paranoid about that happening again. There’s a definite fracture in the relationship, where they can’t talk about it – it’s a big elephant in the room and it causes a lot of tension between them. So he’s buttoned up; he’s very British in that way – he can’t really engage with his emotions. What sort of comedy is this? There’s a little bit of everything, heightened comedy, pratfalls, the works. Mostly though it’s realistic, in terms of it’s more about the situation – where they are and the kind of characters they are and how they collide off each other. That’s where the comedy turns up. And rather than a set situation like in a sitcom we’ve filmed in lots of different locations, so you get a real sense of place and time. Literally, you know, you take the roof off a place and examine this little community. What do you remember about the 1908s? Well for me it rang a lot of bells of nostalgia for that time. I was a young man, just arrived in London, and it was an exciting, noisy place of opportunity. And that’s very much how it’s presented here, through the eyes of Valentine, who is Walter’s younger brother. He arrives from Sierra Leone, and London’s mad, crazy and loud, but you can do anything and be anything. And that’s what really drew me into it. I came to London in the 1980s and I immediately got involved in radical politics, so I was going to meetings and I heard about all those kinds of things. It was just so exciting and exotic, compared to the West Country, which seemed very sleepy by comparison. I’d be sitting in a meeting talking about Stalinism and Marxism, and how the country was ready for revolution, and I was drawn to it, it was exciting. But I never thought, ‘Actually, this is going to happen’. Britain is quite a conservative place, with a small ‘c’ generally, and change happens slowly here; we’re not a radical place by any means. So I always thought it was exciting and interesting, but generally there’s a day-to-day domestic pragmatism to Britishness, which is very much represented in this show – it’s people just getting on. And, again, that’s what I like about it. Is there a resonance with the times we’re living in now? Absolutely, yeah. Certainly, talking about Valentine’s experience when he arrives from Sierra Leone, there’s an antipathy towards him, and then he sees a bit of racist graffiti, and you think: yeah, this is a depressing thing, this hasn’t changed. In fact, if anything, in the last year or so, it’s ramped up again. Why is your character called Bagpipes? Because of some terribly embarrassing incident that has never really been explained. It’s all a bit vague: he worked in a hardware store, something happened with a vacuum cleaner and nobody knows what. And he doesn’t want to talk about it. • In The Long Run starts on Sky One on March 29.